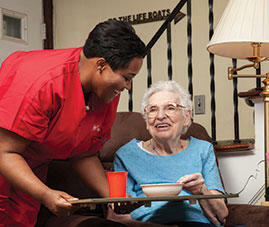 BAYADA Home Health Care in Braintree,MA provides personal care services and non-medical assistance with activities of daily living (ADLs) for adults and seniors when a health issue has made it difficult to manage everyday tasks on your own. Families often seek these services to support safe, independent living, or to provide companionship, assistance, and supervision for a loved one living with dementia or Alzheimer’s disease. Call BAYADA anytime, 24 hours a day, 7 days a week. We will be happy to answer your questions and help explain our services and your insurance benefits. Friendly staff members in our Braintree office are ready to provide you with the highest quality personal home care services available. Call us now at (781) 884-9425, or fill out the form on this page to contact us.